Akiyuki’s tranquil island life is about to come to an end. Unaware of the bombers drifting overhead, he races to the school bus and lets a strange white-haired girl take his place in front of him. Little does he know, this random act of kindness is about to have dramatic and far flung consequences, for himself and his friends. The girl detonates a device which destroys the bus, and turns Akiyuki into a biological weapon. When monsters land all over the island, it’s up to Akiyuki to transform into the powerful Xam’d and protect his friends from harm. That sounds like a passable enough premise for some anime action, but studio Bones, the creators of Fullmetal Alchemist and Eureka Seven, aren’t done there. You see, Xam’d fools you into thinking it’s going to be about giant mecha action and superhero antics- it’s not. In the first episode Akiyuki is nearly turned to stone ( a by-product of the Hiroku seed implanted in his arm) and has to be rescued from this fate by a mysterious young girl named Nakiami. From there he is taken onboard the Zanbani, a postal delivery ship run by a disjointed crew. Despite his best efforts, Akiyuki doesn’t return to his beloved Sentan island for quite some time. Those expecting lots of mecha action may be disappointed, because Xam’d reveals more about family dynamics and character interaction than how to dismember a deadly monster- although there’s quite a bit of that as well. We don’t see much of Akiyuki, fully powered up as Xam’d, at all- which is just fine. When he finally faces his friends, after they’ve ended up on opposing sides in an escalating conflict, Akiyuki still has a human face; he’s still capable of showing pain and remorse. The characters are all wonderfully flawed, from Ishu, the reclusive captain of the airship, to Akiyuki’s love interest Haru, who has to juggle her feelings for the protagonist with her newfound duty as a soldier. With each new episode, you feel like you’re being reunited with an oddball family. None of them seem to get along very well, yet in the most desperate moments we see how much they really care about one another. The story stays on-task throughout the thirteen episodes, and keeps its momentum right up until the final cliff-hanger. This is a world fully fleshed out and realised, thanks to some great character designs by Kenji Mizuhata. The little details like the instruments aboard the airship through to the retro-look school bus and all the weapon and vehicle designs really serve to draw us in to the world of Xam’d. The animation looks very smooth and clean, with a luscious palette for the backdrops. Sound design is also superb, with everything from gunshots to the roars and whoops of flying ships sounding convincing. Michiru Oshima’s soundtrack is for the most part mesmerising, but some of the recurring tracks can get a little repetitive later in the series. Although an alternate opening and ending doesn’t sound like great value, these are definitely worth the watch. Both songs and animation sequences are the ones that originally went to air, and are superior to what we see on this blu-ray. 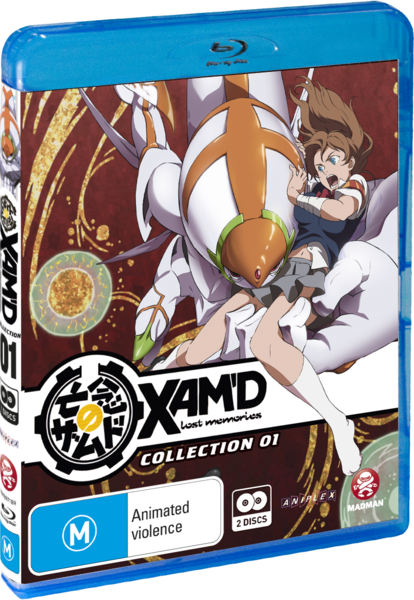 If you’re after an anime fix but you like your action offset by a good dose of character development and interaction, Xam’d is for you. It’s engaging, beautiful and exciting.